Patent Landscaping is focused to extract insights on various areas to facilitate and influence informed strategic decisions. Below is a sample version of the analysis. Please feel free to contact us if you would like to have a copy of the detailed report. The use of enzymes in the dairy industry is well established, and constitutes a huge chunk in food and beverage market currently. Dairy enzymes are the enzymes that are used for the production of milk products. Some of the uses of these enzymes are to improve the flavour, texture, quality and shelf life of the milk products. 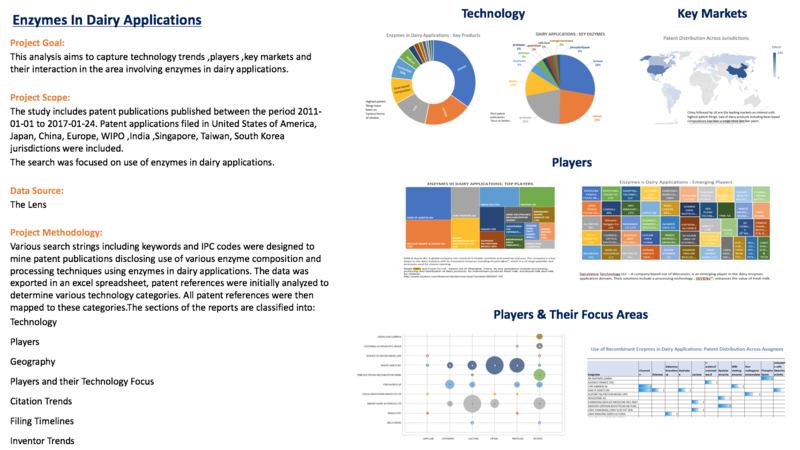 The sample analysis given below is representative from an analysis that summarizes the top enzymes that have been used in the dairy industry in the past five years. The landscape also gives an overview of the top assignees, filing trends, and lots of additional information, that will be of great importance to make the appropriate overview and make informed strategic decisions.